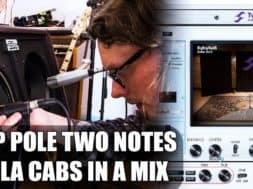 Home Tutorials and News Zilla inspired Cab Collection for Two Notes Torpedo and Wall of Sound – OUT NOW! Previous Video New Zilla Cabs demo for Two Notes Wall of Sound + Torpedo - Mixing 14 guitars! Hop Pole Studios have released a collection of guitar cabinets for Two Notes Torpedo hardware and Wall of Sound plugin, which works with Pro Tools, Logic, Cubase, Reaper and more. Gone are the days of having to have a guitar amp blasting out deafening noise just to get a good recording or live tone – now you can plug your preamp into a Torpedo CAB, or your whole tube head into a Torpedo Studio or Live, and get the benefits of the easy to use cab system, with choice of mics, where to put them and how far away! previous New Zilla Cabs demo for Two Notes Wall of Sound + Torpedo - Mixing 14 guitars! New Zilla Cabs demo for Two Notes Wall of Sound + Torpedo – Mixing 14 guitars!